Welcome to the Fit Small Business Xero training course! 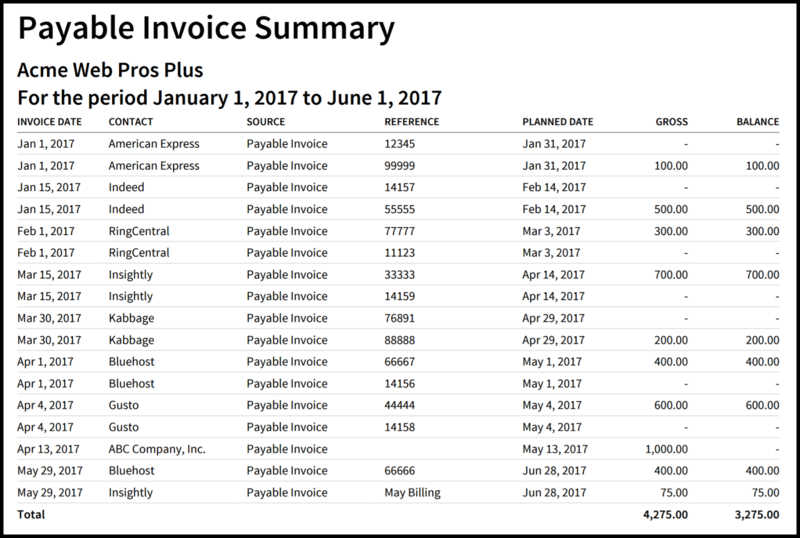 In this lesson, we’re going to cover how to create an accounts payable aging report in Xero. Why Is It Important to Create an Accounts Payable Aging Report? Write a check for bills that are due in the next 7 days. Set up an online payment for bills that are due in less than 7 days. Review the total bills coming due in the next few weeks and compare it to your expected cash inflow to ensure you will be able to make payments on time. Note: The accuracy of the A/P Aging report is dependent on whether or not you have entered all of your bills in Xero and that you have marked them paid manually or printed a check directly from Xero. Gives you the ability to forecast outgoing cash flow. Allows you to be proactive and notify your supplier to make payment arrangements if you are unable to pay a bill by the due date. Provides insight into how much money you are spending with each supplier and to ensure that there are no bills that appear which you did not authorize. Follow the steps below to run an accounts payable aging report. Note: Assuming that you have entered your bills into Xero, the data for this report is already in Xero. Make sure that you have set up payment terms for each supplier so that your due dates are accurate. You must also enter payments that you make to suppliers online or via check into Xero so that your bills will be marked as paid; otherwise the report will not be accurate. Step 1 – Navigate to All Reports as indicated in the screenshot below. Step 2 – Below the Purchases group, you will see 3 reports. To show all available reports, click on the “…” as indicated in the screenshot below. Step 3 – After expanding the group, you should now see a total of 9 reports. Xero has redesigned several reports and that is the reason why some reports have the “New” button and some do not. For the purposes of this lesson, we will focus on the 4 New reports as indicated below. Note: For reports that you plan to use often, you can mark them as a favorite by clicking the star located to the left of the report name. In the above screenshot, the Aged Payables report has been marked as a favorite report so it will now show directly under the reports dropdown on the ribbon. 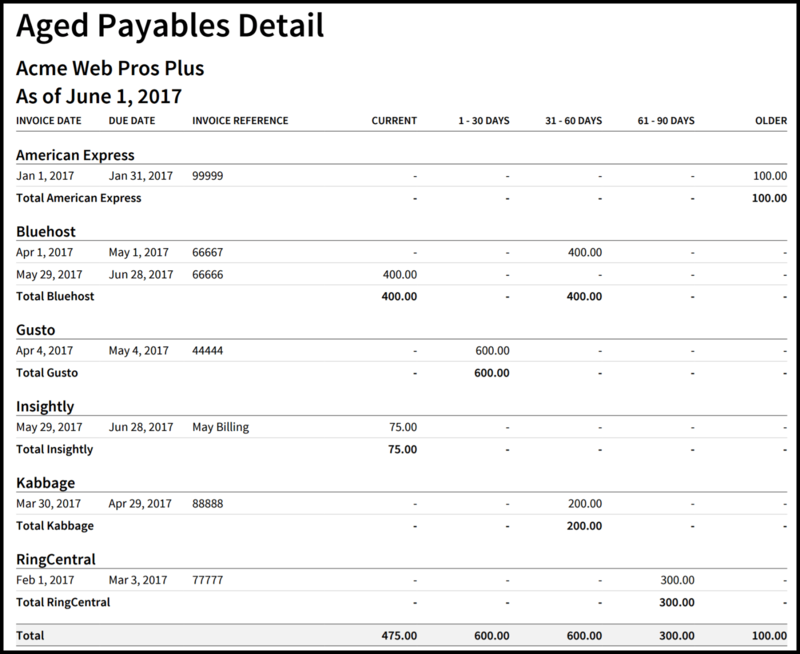 This report displays the supplier contact, due date, invoice number and whether or not the bill is current, which means it has not become due yet. If the bill is overdue, it will show the number of days it is past due (i.e. 1-30, 31-60 days, 61-90 days). As we discussed previously, you can use this report to determine what bills need to be paid a well as to ensure you have enough cashflow to cover the bills coming due. Note: You can easily drill down to a specific invoice by clicking anywhere in the invoice row. This report is a summarized version of the Aged Payables Detail report (above). It shows the total of all bills that are current or past due for each supplier contact as well as outstanding expense claims. This report is helpful if you want to view your total outstanding bills at a quick glance. Note: If you want to see the details of a bill, you can click on any of the totals in the report to drill down to the bills that make up the total amount. 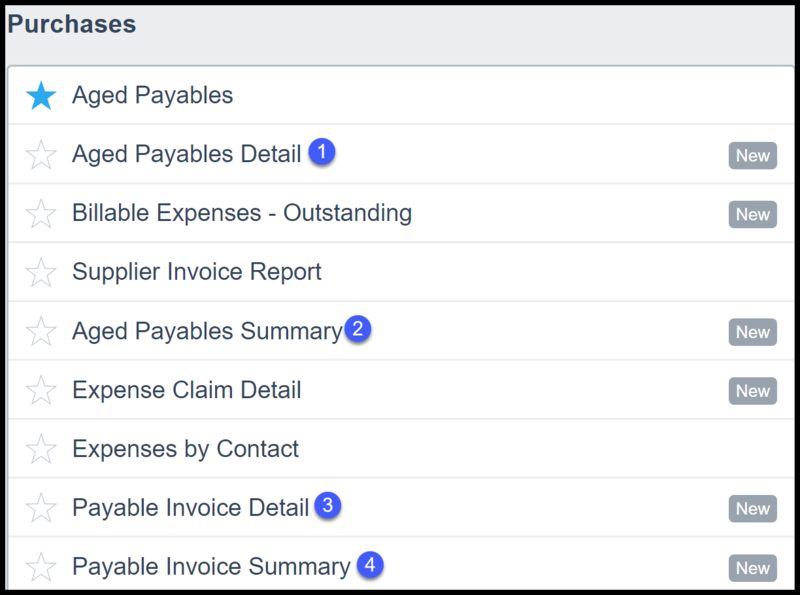 Aged Payables Summary report run in Xero. This report shows the line by line details of all outstanding bills, credit notes, overpayments and prepayments as of a point in time. 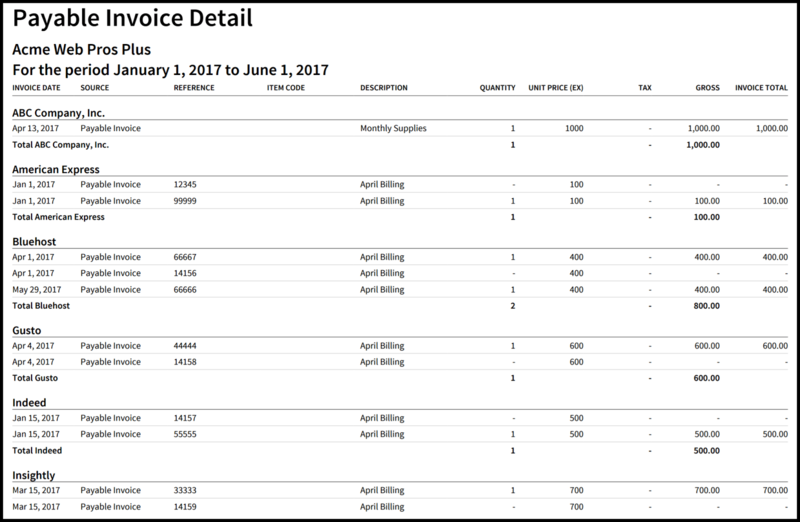 Run this report when you want to see the details of multiple bills without having to display them one by one. Note: To drill down on a bill or credit note, just click on the transaction that you wish to see more details for. 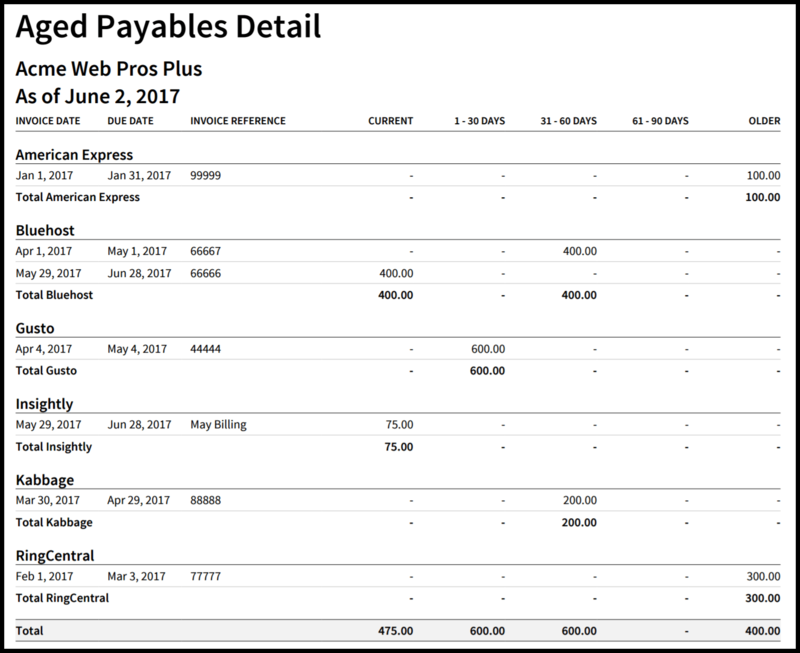 This report is a summarized version of the Payables Invoice Detail report (above). It includes a total of all outstanding bills, credit notes, overpayments and prepayments by supplier contact. It does not show the line by line details of each bill or credit note, but it does show the original bill amount (Gross column) and the current balance due (Balance column). Note: To drill down on a bill or credit note, just click on the transaction that you wish to see more details for. Draft – This option allows you to create a report that you or someone else can make changes to later on. You might create several draft reports before you are ready to publish them. Published – This option is used to save reports when you are finalizing the books for the month or the year. A published report will not change if for some reason the information in the system has been changed or updated in some way. You can only publish reports if you have the Advisor user role. Check out how to invite multiple users to learn more about user permissions. Custom – Use this option if you want to save the report format so that you don’t have to recreate it each time you run the report. Xero will ask you if you would like to make this template your default. Step 1 – Click on the “Report Settings” button as indicated in the screenshot below. Step 2 – The following screen should display as indicated in the screenshot below. Date Range – Select the date range you would like to run the report for. Ageing By – Select the date that you would like to use to calculate the “age” of the bill. 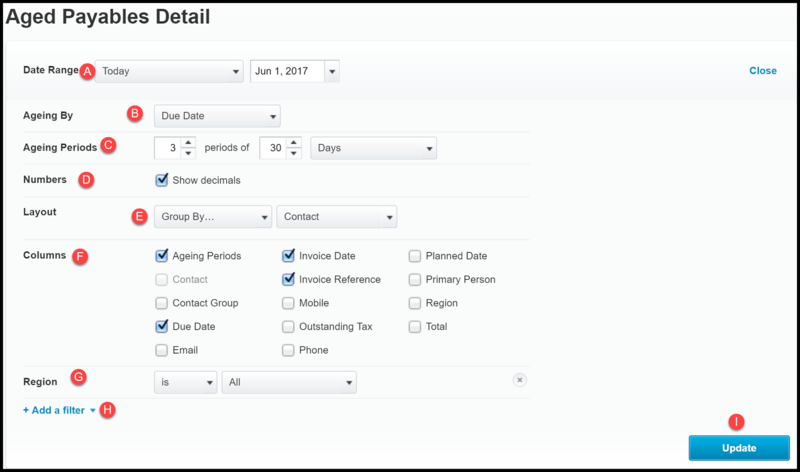 You can select due date or invoice(bill) date from the dropdown. Ageing Periods – You can determine the aging “buckets” to set up. For example, in the Aged Payables Summary report we discussed previously, there are 3 periods set up with 30 days each (i.e. 1-30 days, 31-60 days and 61-90 days). Numbers – Select whether or not you want to show decimals on the report or just whole numbers only without the cents. Group By – From the dropdown, you can select how you would like to group the info on the reports. The choices here are Contact, Contact Group, Invoice Date, Reference, Invoice Seen, Invoice Sent, Tracking category (i.e. Region). 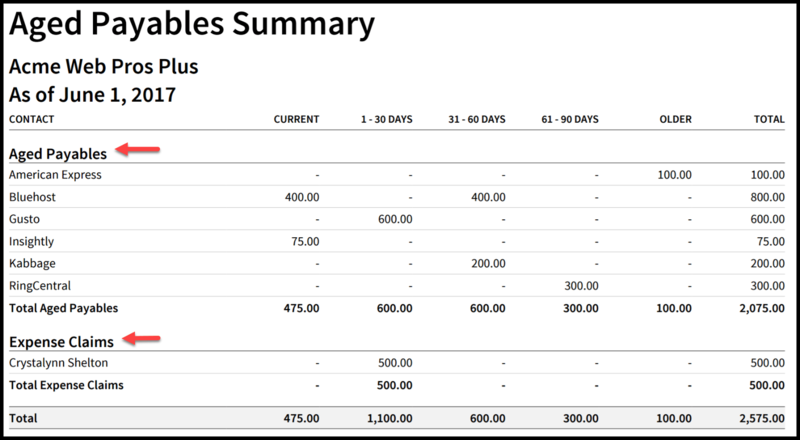 Columns – Place a checkmark next to each column that you would like to include on your report. Note: The columns available may vary depending on the report you are running. Region (tracking category) – If you have set up tracking categories, they will be listed here so that you can filter these reports to show or hide this info. Add a filter – If you would like to filter on any column listed in item F above, you can do so by clicking the “add a filter” button and making your selections. Update– Click the “Update” button to save your changes. That wraps up the section on how to create an accounts payable aging report. The next lesson in our Xero Training Course will be how to accept online payments from customers. In this lesson, we will walk you through how to set up payment services in Xero so that you can accept credit card payments from your customers. To access this lesson or any of the others in the series, click here. For a free 30-day trial of Xero, click the link below.